Biography* � Mrs. Travis (Jacqueline Lorenz) McClinton noted on a Shadrack Guthrie descendant list: [William Edward Guthrie] lived Benton Co., TN. Scotch-Irish. Played fiddle. Farmer, ginner, miller. Info. from Mary Downum says Wm. Downum says Wm. E. & Etheldra came by boat to Indianola, TX 1850 & ox wagon to Sweet Home, Lavaca Co. TX. On p. 60 of On The Headwaters of the Lavaca and the Navidad by Paul C. Boethel noted: Arriving about the same time [as the F. G. Culpepper family] and also settling in the Sweet Home sector was the family of William E. Guthrie, his wife Etheldra and twelve children. Guthrie was a farmer, miller and merchant, and is reported to have constructed the second mill in the county. The Culpepper and the Guthries intermarried. Martha E. Culpepper first married William Guthrie, and on his death married Marion Guthrie. A second daughter, Amanda Culpepper, married still another Guthrie, Shadrack, August 23, 1872. James named his first son, Thomas Louis so it makes sense that he would give his son, James, a different middle name. James' father, Francis G. Culpepper was noted with his family in the 1830 census of Talbot, Co., GA and this is probably where James L. Culpepper was born. According to the 2 Feb 1898 Shiner Gazette Francis G. Culpepper moved the family to Alabama in 1834 and this is where James was noted as one of two males 5-10 years old in the household of Francis Culpepper in the 1840 census of Chambers Co., AL. The 2 Feb 1898 Shiner Gazette noted that Francis G. Culpepper moved his family to Mississippi in 1846 and this is where a 16 year old "J. L. Culpepper" emerges in the F. G. Culpepper household in the 1850 census of Lafayette Co., MS. In 1851, Francis G. Culpepper moved his family to Lavaca Co., TX and this is where James L. Culpepper married his first wife, Eliza Jane Harbour, in 1856. Unfortunately, Eliza Jane died and James married her sister, Margaret Hall Harbour, in 1860. When the Civil War began, James L. Culpepper joined the Confederate Army. On p. 54 of On The Headwaters of the Lavaca and the Navidad Paul C. Boethel noted "J. L. Culpepper, private" on the: Muster roll of Frederick J. Malone's Company, organized at Sweet Home, August 6, 1861. Enlistment for state service for twelve months. Note on roll: "No arms of an improved style." James' older brother, J. T. J. Culpepper, was listed as "1st sergeant" on the same roster. On p. 55, Judge Boethel continues: As military units for service in the Confederate army were recruited, the personnel of Searcy's and Malone's companies were sorely depleted and eventually the units were disbanded to be superceded by other state service units. James L. Culpepper apparently went on to serve in Company B, Hardeman's TX Cavalry during the Civil War. After the war, James returned home and was noted as a farmer with his family in the 1870 census of Lavaca Co., TX living next door to his brother, William. James had real estate valued as $500 and personal property valued as $300. His son, James L. Culpepper, Jr. was not listed with the family and two children, a 2 year old "Elenor" born in Texas and a 1 year old "Egleintine" born in Texas were also listed in the household and have not yet been accounted for. Perhaps James L. Culpepper's daughter, Virginia Bell, was originally named after her grandmother. Perhaps Eleanor was a child (a twin of Harvey?) who died before the 1870 census. Or maybe the census taker needed some extra heads. 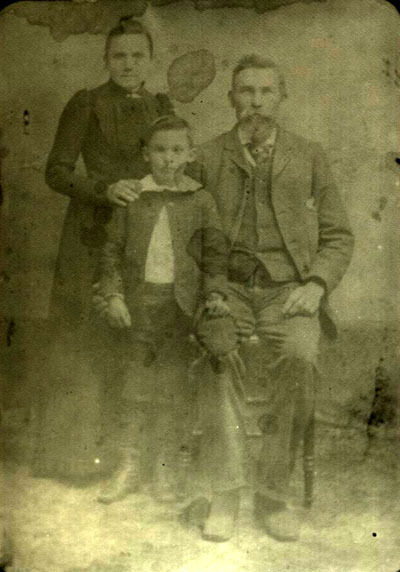 James remained in Lavaca Co., TX through 1900 where he was noted with his wife and children in the 1880 and 1900 census. Francis Culpepper, 2 M0-5, 2 M5-10, 3 M10-15, 1 M30-40, 2 F0-5, 1 F5-10, 1 F30-40, 0 slaves. Salina Culpepper, 1, F, MS.
Lavaca Co., TX: James L. Culpepper and Eliza Jane Harbor, 30 Dec 1856, Book I, p. 159. Margaret Culpepper, 22, F, GA.
Mathew John Culpepper, RFD A, Stockdale, Wilson Co., Texas, age 40, born 11 Oct 1877, White, Farmer for self; Nearest relative: Mrs. Lela Culpepper-wife, RFD A, Stockdale, Wilson Co., Texas. Medium height, Stout build, Blue eyes, Dark hair, no disabilities. Registered 12 Sep 1918, Stockdale, Wilson Co., Texas. Ella Reese Culpepper, 27 Feb 1890 – 19 Dec 1976. Rubin Curtis Culpepper, RFD A, Stockdale, Wilson Co., Texas, age 39, born 29 Mar 1879, White, Farmer for self at RFD A, Stockdale, Wilson Co., Texas; Nearest relative: Ella Culpepper-wife, RFD A, Stockdale, Wilson Co., Texas. Tall height, Stout build, Blue eyes, Light hair, no disabilities. Registered 12 Sep 1918, Stockdale, Wilson Co., Texas. Merle Ridgway, Houston, TX, 1999 records, Merle Ridgway to Lew Griffin, 1999. Francis G. Culpepper died 21 Oct 1903 in Lavaca Co., TX, Cert 39857. Biography* � In the 1900 census of Lavaca Co., TX, Margaret was listed as having been born Feb 1841 in Mississippi. She was also listed as having been born in Mississippi in the 1870 and 1880 census records and on the "Delayed Birth Certificate" for her youngest child, Margaret Hall Culpepper, which Mrs. Travis (Jacqueline Lorenz) McClinton referenced in a 10 Jul 1989 letter. Only in the 1860 census was Margaret Harbour's place of birth given as Georgia. R. C. Culpepper, Wilson Co., Apr 5 1928, 19267. A granddaughter, Mrs. George (Ruby Culpepper) Massey, wrote 8 Jan 1979 "I feel sure the Daniel was the D. in Shadrack." There is a question about Shadrack's place of birth. His parents were recorded in Talbot Co., GA in the 1830 census and in Chambers Co., AL in the 1840 census so presumably Shadrack was born in Georgia or Alabama. 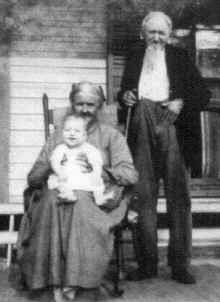 According to the 2 Feb 1898 Shiner Gazette Shadrack's father, Francis G. Culpepper, moved his family to Alabama in 1834 but it is not known if it was before or after the birth of Shadrack D. Culpepper. In the 1850 census presumably based on information supplied by his parents, Shadrack was listed as having been born in South Carolina. In the 1860 census, in his parents household, Shadrack was listed as having been born in Alabama and in the 1870 census, still with his parents, he was listed as having been born in Georgia. In any event, Shadrack would have spent his childhood in Alabama. According to the 2 1898 Shiner Gazette the Francis G. Culpepper family moved to Mississippi in 1846 and this is where Shadrack was noted living with his parents in the 1850 census. Shadrack would then have moved with his parents to Lavaca Co., TX in 1851 and this is where Shadrack was noted with his parents in the 1860 Hallettsville, Lavaca Co., TX census. When the Civil War began, Shadrack joined the Confederate Army. He served in Company B, Hardeman's TX Cavalry. After the war, he returned home and "Shadrick D. Culpepper" was noted as a farmer in the household of his father, Frank Culpepper in the 1870 census of Lavaca Co., TX. Some time after this census, Shadrack married and is next noted in the 1880 census of Lavaca Co., TX with his wife and young son, living next door to his father, Frank Culpepper. Slaves: 1 F40, 1 M20, 1 F12, 1 M6. Francis Cary Culpepper, 1120 Paso Hondo St., San Antonio, Bexar Co., Texas, age 40, born 20 Dec 1877, Caucasian, Letter Carrier for US Post Office in San Antonio, Nearest relative: Mrs. Julia Culpepper, Wife, 1120 Paso Hondo St., San Antonio, Bexar Co., Texas, Medium height, Medium build, Blue eyes, Light hair, No disabilities. Registered 12 Sep 1918 at San Antonio, Bexar Co., Texas. F. D. Casey Culpepper, M, 2, Son, S, TX AL AL. Benjamine Franklin Culpepper, 209 W. Locust, San Antonio, Bexar Co., Texas, age 36, born 3 Feb 1882, Caucasian, Trainman for San Antonio Public Service Co., Nearest relative: Mrs. Tempa T. Culpepper, Mother, 1120 Paso Hondo St., San Antonio, Bexar Co., Texas, Medium height, Medium build, Light blue eyes, Brown hair, No disabilities. Registered 12 Sep 1918 at San Antonio, Bexar Co., Texas. 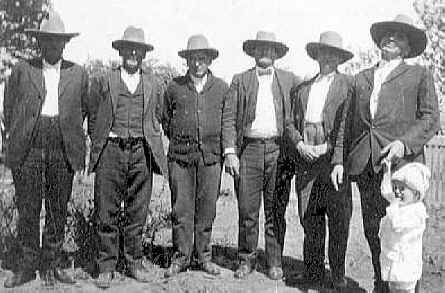 Tempa L. Culpepper, Bexar Co., May 5 1927, 14829. Lizzie Culpepper, Daughter, F, Mar-1884, 16, S, TX AL AL. Tempie Culpepper, Mother-in-Law, F, 52, wid, ch 3/3, AL AL AL. Tempy Culpepper, Mother, F, 62, WD, AL US US. The 1850 census recorded his name as "Francis B." The F. G. Culpepper Bible also recorded Benjamin's death: _________________________7th Son of F. G. Culpepper _________________________(Benjamin F. Culpepper) _________________________Departed this life _________________________Dec. 24 - 1854. Burial* circa 25 Jan 1912� Her body was interred circa 25 Jan 1912 at Greenleaf Cemetery, Brownwood, Brown Co., Texas. Presumably Sarah was born in Chambers Co., AL where her father was recorded in the 1840 census. Sarah was noted as one of two females 0-5 years of age in her father's household. According to the 2 Feb 1898 Shiner Gazette Francis G. Culpepper moved his family to Lafayette Co., MS and this is where Sarah was noted with her parents in the 1850 Lafayette Co., MS. In 1851, Sarah would have moved with her parents to Lavaca Co. TX and she was noted with her parents in the 1860 Hallettsville, Lavaca Co., TX census presumably the census district which included Sweet Home. In 1861, Sarah married J. B. Mauldin and according to an article "A Little History, The Great Pecan A Fortune in a Nut Shell A New Line of Life Insurance" written by a son, William Franklin Mauldin, written in 1940, Sarah and J. B. Mauldin settled in a 320 acre ranch on Bear Creek, Williamson Co., TX where the family remained until 1878 when J. B. Mauldin bought 1476 acres in Lampasas Co., TX. This is where Sarah was noted with her husband in the 1880 census. Mrs. George (Ruby Culpepper) Massey wrote 8 Jan 1979 about her search of Davis Morris Funeral Home records which showed that Sarah Matilda (Culpepper) Mauldin died in Guadalupe Co., TX: These records are typed as the appear on the old records. I looked on the map and I could not find Guadalupe Texas. It may be county and the town was La Vernia for the undertaker was from this town. From Colleen Andrews Morris, 3 Jun 2004: My Dad wrote "J. T. Mauldin was the third son of John Bryant Mauldin and Matilda Culpepper Mauldin. Shortly after the turn of the century, health of his father began to fail. He (J. T.) sold his Childress ranch and moved the family and parents to Sutherland Springs health resort.. When his parents died, J. T. and wife moved to San Antonio." Sutherland Springs and La Vernia are both in Wilson County which borders Guadalupe County. My Grandmother Iris Mauldin met and married her husband John Franklin Andrews in Floresville, Wilson County. Burial* say 18 Jun 1911� His body was interred say 18 Jun 1911 at Greenleaf Cemetery, Brownwood, Brown Co., Texas. 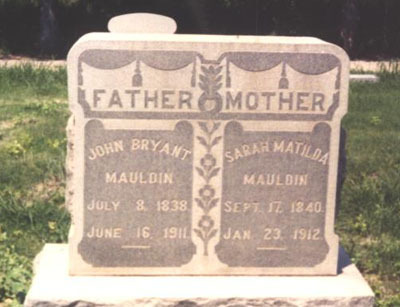 Biography* � John was listed as "John Bryant Mauldin" in the Texas Death Index and on his tombstone however his middle name was presumably the maiden name of his mother, Susan Jane Bryan. Mrs. George (Ruby Culpepper) Massey wrote 8 Jan 1979 that according to cemetery records, John B. Mauldin lived at Bangs, TX. Bangs is about 10 miles east of Brownwood, Brown Co., TX. Back in 1865, My Father John B. Mauldin & My Grand Father Dr. W. P. Mauldin known among his friends as Dr. Billy. In 1868 my Father improved a little three hundred & twenty acre ranch on Bear Creek Williamson County Texas consisting of an upland farm where the houses were & 40 acres farm in the valley on Bear Creek. In clearing this valley land they found in the center of the clearing a mammoth pecan tree which they left standing & which we observed never failed to yield a bountiful crop of nuts which we boys enjoyed very much. We would gather a large sack full each winter & leave a bountiful crop for the wild Turkies & hogs to feast upon for Months as the wind brought the nuts down few at a time for Nov. 1st & continued to fall till March & April the next year. [My father & grandfather?] lived on the frontier in Lampasas County Texas and were Indian scouts. I can remember hearing them talk of the big Pecan crop, saying the wild Turkeys & Hogs would be fine eating this winter as they would be very fat on the Pecans. & the Indians too would visit us often, most every light moon & kill our neighbors & drive away our stock. In those days the Indians used the Pecan most extensively for their food. The savage knew more of nature three hundred years ago that civilized nations know today, they used the Pecan as a food. More that Sixty percent of our people do not know that now. The crow & the squirrel have a fine time in the big Old Native Pecan trees that grew on the banks of the Colorado river but strange to say no man ever saw a crow west of the Colorado river. They would not cross. The Pecan tree grows along the banks of most every water course in Texas but strange to say, the largest trees were not on the bank of the streams, they were well back away from other trees where they could have room to spread. In 1878 my Father decided the little Ranch was too small. Being of a Pioneering Nature, he sold the little Ranch, bought 1476 acres of fine land in Lampasas County Thirty Miles from where we had fought the Indians a few years before. There was also plenty of open range here, and also plenty of Pecan trees on the River & we still gathered our usual supply of winter Pecans. By this time we had accumulated quite a little family, consisting of Eleven Boys & a sister for every brother. Now guess - we were all healthy. We ate lots of Pecan Nuts. As well as accumulating a large family we had also accumulated a nice herd of cattle, horses, sheep & hogs. We were stock farmers, had 150 acres in farm. We raised everything we consumed & consumed most all we raised. We raised wheat, corn, potatoes & great stacks of hay, had plenty of cows that we milked every day. We always had steers to sell but never sold any she cattle. Sold wool, Lambs & Mutton & always had horses for the horse buyer. In 1886 our herds had outgrown our range, so we decided to drive to Colorado territory and sell out. We gathered our herds with little hired help & on April 14th 1886 we put our herd on the trail routed through the pan handle of Texas to Colorado. My Father put me in charge as I was the oldest son. We were on the trail four & one half months encountering many, many hardships, but made a successful drive & a good sale & were back home safe in five months. On our way out, at Brownwood Texas, located on the west side of the Pecan Bayou or River. The Bayou or River was named for its great Number of Pecan trees. The town was located in 1848 by Uncle Jimmie Brown's trading post, later named "Brownwood." In the valley before crossing the Pecan Bayou was very thick Mesquite brush. We had a hard time getting our cattle through without a loss but we did it and went our way. Two years later, in 1888, I went through that same valley, with another herd of cattle, but where the mesquite brush was there were three hundred acres of young Pecan trees. In 1895 I saw A. L. Swindon sell his crop of nuts to J. R. Looney a Grocery Man for $6000.00. Those were the common seedling nut. That year I was converted to the Pecan industry and have never been "a backslider" or lost faith in the Queen of all trees, the Pecan. This man Swindon was the Son-in-law of J. I. Campbell one of the Lumber Kings of Texas. On my first trip through the Panhandle of Texas in 1886 I saw Pecan trees at Childress, near Amarillo that looked to be Seventy five years old & bearing heavy & not another tree in that country. But there are thousands of young trees in the Panhandle now. That altitude is about Thirty five hundred feet. I sold & transplanted my first Pecan trees at Brownwood Texas in 1895, those were seedling trees for shade. In 1898 I sold the first budded trees, propagated by Dr. W. R. Stuart Ocean Springs Mississippi. In 1902 I sold the first budded Pecan trees planted in San Angelo Texas. People said they would not grow away from the River bank. But I sold many trees & planted in yards & parks in San Angelo & today 85 % of the shade trees planted in San Angelo are Pecan trees. The streets are lined with beautiful tax paying Pecan trees. A Christmas Card 1940 from San Angelo Texas from a niece in part says, "Dearest Uncle Frank, would so love to see you. How are you? Wish you could see the Pecan Nuts we gathered from our trees this year. Texas yards certainly made a good crop." San Angelo Texas is recognized today as the largest inland Pecan shipping center in the World. In 1919 the state of Texas had 85 % of the seedling Pecan trees in the world. In 1917 I sold the first Pecan trees ever put in the El Paso Valley. I put El Paso on the map in the Pecan industry. I sold Dean Stockman's [sic, Stahmann's] Father Pecan trees in 1918 & his Son Dean is at Mesquite New Mexico now planting 4000 acres to Pecan trees - so you see how the industry grows. The largest Pecan tree in the world is in the El Paso valley Twenty miles below El Paso. One mile away from the Rio Grande River, this tree measures over eighteen feet around the trunk, is 108 feet spread looks to be one hundred feet high & is supposed to be one thousand to fifteen hundred years old. A Pecan tree never dies from age. Old timers there say this tree never fails to bear a good crop of nuts & is believed to bear fifteen hundred to two thousand pounds of Nuts in one year. It's on Mexican property & everyone gathers its nuts. This tree is growing in bad alkali ground, a water table of Ten feet. There is only one other Old Pecan tree in the El Paso Valley, this tree stands just one mile from the big tree & is about Seventy years old growing in the Sanddunes where no well water could be found - in the last few years Irrigation water has been run near this tree & the owner has seven acres in alfalfa & he told me in 1919 tht he gathered 750 pounds of Nuts from that tree that fall & sold them at 35 cents per pound, Making far more money than the Seven acres of alfalfa. During four years I spent in the El Paso valley I planted many Pecan trees which are proving my statement, the Pecan tree is the greatest money making tree knnown to mankind. In Jan[?] 1922 I went [to] Imperial Valley & sold Pecan trees & that winter shipped Two car loads from Monticello Fla. Out of that shipment I planted Ten acres in Jan. 1923 for J. M. Johnson in San Fernando Valley - Converting a walnut man to a Pecan man, [to] which he will testify. Trees in that grove last year produced as much as 165 pounds of Nuts each. Those trees are the paper-shell "Schley," The Variety we will grow in Pecan Park Estate. Pecan Park Estate is where you can plant your money & see your dollars grow. If you are sick it will make you well. If you are well it will make you happy just owing to how much you invest as to how rich you will be. Pecan Park Estate has the climate, the water & as good land as there is in the state to grow Pecan trees & ideal climate in which to grow good trees & a bountiful crop of Nuts. We expect to plant hundreds of acres in Pecan trees on this tract as my years of Experience tells me there is no better location & few as good as you will find in Pecan Park Estate for a sure investment. One would be surprised to know that there are hundreds of giant seedling Pecan trees Seventy five to one hundred years old that never fail to bear a crop every year in the state of Calif. and the result of those old giant trees & the constant pounding of the far sighted Pecan Nursery Man California is fast coming into her own in the production of the choice paper shell nut. Back to New Mexico, for a little talk. In 1929 I was in Roswell talking Pecan. The Monticello Fla. Pecan Nursery Company had me on the air twice a week for two months selling Schley & Mahan Pecan trees while talking there an old man said have you ever seen my Pecan trees. I said no, where are they. He said Ten miles West of here just off the highway & told me how to find the place. He says my folks came here from Texas 65 years ago when I was five years old. My Mother brought a little bag of Pecans & started planting. My father laughed & said you'll never have any Pecans. Today there are eleven trees in a little group. If I had a hundred trees like them I would not have to work, old as I am. I went to see those trees. They were in a very small space only Seventy five feet across. The largest tree measured 11 1/2 feet around, looked to be Eighty feet high. Those trees were right out [in] the open pasture. No protection. A few years ago I was talking with G. R. Crane three miles East of Escondido near San Diego. He has a large Pecan tree growing near the Center of a 12 acre Orange grove. He asked, what insect bothers a Pecan tree? I said you say you have owned this grove Twelve years why don't you tell me? He said there has never been an insect on that tree & every insect in Calif. has been here to see me. He said that tree makes more money than Thirty of the best trees in the Orange grove, no pruning no spraying & a crop every year. Last year I weighed 750 pounds from that tree. 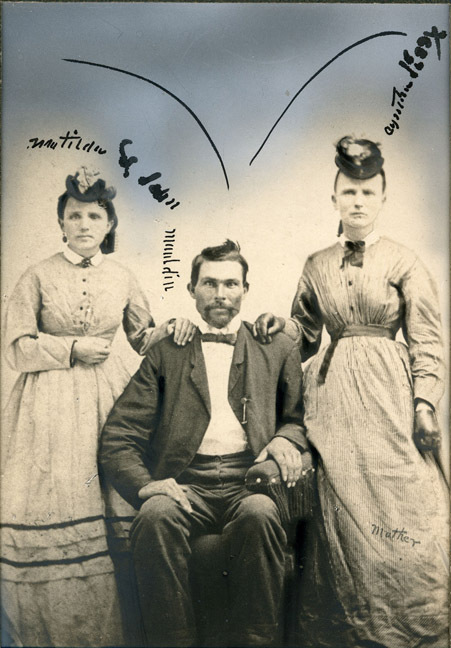 Biography* � John Edgar who was born in 1820, came to Texas about 1850 to clear his brothers grant, which was located in northeastern DeWitt County. John was married three times. His first wife was Molly Brown, second was the widow Knox, and the third was the widow Ellen DeLooch. The widow Knox was a Culpepper by birth. She had a son, Thad, that John Edgar raised. John Edgar died on September 12, 1906 and is buried in the Edgar family cemetery. Lavaca Co., TX: Amanda Culpepper and Shadrack Guthrie, 21 Aug 1872, Book II, p. 153. Biography* � Shadrack was listed as "Shadrack" Guthrie in the 1880 census. On p. 99 of The Harbours in America by Louis J. Williams, Rachel Harbour was listed as having married "Lee Shade Guthrie" 11 Aug 1856, Lavaca Co., TX. Mrs. Travis (Jacqueline Lorenz) McClinton listed "Shadrach R." Guthrie on a Shadrack Guthrie descendant list and noted that an "S. Guthrie married Mrs. Rachel Hars Aug 19, 1856 Lavaca Co., TX." But the Lavaca Co., TX Marriage Book 1, p. 178 appears to list "H. Guthrie" and "Rachel Harbor." Jacqueline added: Mrs. Evelyn Cunyus, a granddaughter of Shadrach, says that he and his first wife Rachel had a plantation that was destroyed during the Civil War and she thought it was in Mississippi. The 1850 census of Coahoma Co., Miss. lists Shadrach as a grocer. On the 1860 census of Coahoma Co. are listed Rachel and Jennie. Shadrach is listed as a commercial merchant. He was a Mason at Friar Point, Coahoma Co., Miss in 1850. When he settled in Salado, Tx he owned a store. Is it possible that two different Guthrie/Rachel marriages are being tracked? 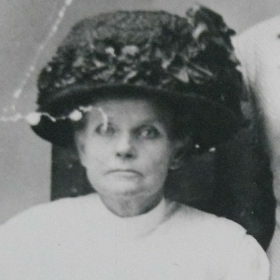 Mrs. Travis (Jacqueline Lorenz) McClinton noted in her record of Mt. Olive Cemetery, Lavaca Co., TX: Shadrack, husband of Amanda [Culpepper], was a brother of William E. [Guthrie], our great great grandfather, and Rev. Orin Guthrie. Find A Grave Memorial# 7792397. Biography* � Mrs. F. W. (Sadie McGinty) Guinn wrote 16 Jun 1988: James Milton and Mary Frances were married at Old Moulton and established their first home there... later providing the land for the [Baptist] church and cemetery. They had a blacksmith shop at their home.... Old Moulton lives only in memory now (the only building standing is the church) and the present City of Moulton was moved because of the railroad. This was before the turn of the century. The following was written by James M. McGinty, Sr. and was included in a 25 Jul 1988 letter from Mrs. T. D. (Patty Bennett) McGinty: Memorial of the 71st. birthday of myself, J. M. McGinty at Alvin, Texas in the home of my son R. Frank McGinty on this the 10th. day of January nineteen hundred twenty. To my dear children: - Frank, Brad, Charley, John and Jim, and your wives, Tena, Pearl, Sadie and Agnes and my ten grand children. Your gathering here to join each other in commemorating my 71st. birthday is a Heavenly benediction to me. The many valuable presents as tokens of your affections for me are appreciated more than tongue can tell. I rejoice indeed to know that you have heeded the admonition of the Lord wherein He said "Children honor thy Father and thy Mother"; for not only has this nobleness of your lives reflected honor on me but also on her who gave you birth and cared for you in early life. And though her cares for you ceased just 22 years ago today when we laid her in the tomb here in Alvin, still her blessed influence over you abides; and when our hopes of redemption and a happy reunion are changed to glad fruition your mother and I will feel our lives were not in vain. You all deserve lasting praise for your kind affections toward her who has become a companion to me since companionship with your mother was severed by death. It is also a source of happiness to me to see you all cherish the tenderest brotherly feelings not only toward each other, but also toward your deceased sisters - little Anna, whose infant body sleeps in the cemetery in Flatonia since May 7th. 1878:-Linda, who sleeps beside her mother since February 8th. 1899 and Cecil who sleeps in the cemetery at Roswell, New Mexico since October 2nd. 1915. With these the thoughts of past life mingled with joy and sorrows, let us look forward to that life where there shall be fullness of joy and pleasures forever more. Let us esteem the present world wide troubles as the consummation of the end of all evil and the ushering in of all good because of the reign on earth of our Glorious Redeemer. May His peace abide with you until our reunion never to be separated shall have been fully consummated. Photographed* say 1895� She was photographed say 1895 at Medina Co., Texas. Find A Grave Memorial# 76849520. E-mail written Oct 2017 to Lew Griffin from Katey Pearson, Hawaii, e-mail address. Find A Grave Memorial# 76849553. Biography* � Mrs. Travis (Jacqueline Lorenz) McClinton compiled a Family Group record for Silas Guthrie. She noted that he was known as "Gid" and added: [Silas Orr Riddle Guthrie was a] cattle drive Boss from South Texas to Kansas in 1870's & early 1880's then became a rancher in Brewster county. Owned 101 Ranch at Murphysville, TX. Murphysville later had name changed to Alpine, TX, after moving there in the 1890's. Belonged to Masonic Lodge #80 in Hallettsville, TX in 1890. Mrs. McClinton added "Opal Copeland Kemp says, 'Uncle Gid fought the last duel that was fought in Texas. He fought George Johnston over some cattle in Lavaca County, TX.'" The Francis G. Culpepper family was noted in Lafayette Co., MS in the 1850 census and in the 1860 census F. G. Culpepper listed Mississippi as the birth place of his daughter "E. Ann." Culpepper Heritage Association records note: Georgia T. Culpepper... was born enroute to Texas from Lafayette, Fayette Co., Mississippi. They crossed the Mississippi River at Vicksburg, Mississippi. She was named "Georgia Ann Texas" Culpepper, in memory of her birth while in the hardships of the wagon trip from Georgia to Texas. Georgia was noted with her parents in 1860, 1870 and 1880 census records. In 1880, she married B. F. Burke and was noted with her husband and children in 1900 Lavaca Co., TX census records. Georgia's father, F. G. Culpepper, was also living with the family. Henry Welch, M, 35, Laborer, S, IL IL IL. Lavaca Co., TX: Georgia A. Culpepper and B. F. Burke, 15 Dec 1880, Book II, p. 536. F. G. Culpepper, Father-in-law, M, Jan-1803, Wid, NC [SC in all prev censuses] AR MS.